DASH PART ONLY. Hardware, wiring, and other accessories not included. Not for vehicles with Myford Touch. ISO DIN radio provision with pocket. ISO DDIN radio provision. Included with kit. Ford Focus 2012-14 (Without MyFord Touch). ISO DIN radio provision with pocket. ISO DDIN radio provision. See the VP-5827VENT TRIM PANELS for multiple color options. Metra patented Snap-In ISO Support System Under-radio pocket Recessed DIN mount ISO trim ring Contoured to match factory dashboard High-grade ABS plastic Comprehensive instruction manual All necessary hardware for easy installation . 70-1761 Toyota Harness. TYTO-01 Toyota Digital Amp Interface Harness. • We strongly encourage professional installation of any electronic devices. Designed specifically for the installation of double-DIN radios or two single-DIN radios. Vue 2006-2007. G6 2009-up. Aura 2007-2009. Malibu 2004-up. Equinox 2005-2006. Cobalt 2005-up. • Warranty service will be refused if serial number of unit does not match that of serial number sold by us. Subaru Outback 2005-2009. Subaru Legacy 2005-2009. • We strongly encourage professional installation of any electronic devices. General Features: Metra Single Double Din Installation Dash Kit/ISO Radio - Silver Compatible with 2003-2005 Mazda 6 vehicles Comes with a storage pocket below the radio Wiring Harness included Retains all climate features Retains full functionality of factory HVAC controls New electronics and soft buttons now allow for DDin install Designed to match factory dash contours Showing a gapless fit between the dash and the kit Molded and painted silver to match factory dashboard High-grade & Heavy-duty ABS plastic structure Factory style texture Also available in Black Kit Includes: Radio/Climate Control Housing Radio . 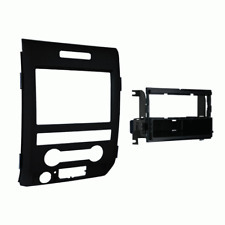 Metra 99-7616 Install Dash Kit for 2012 Nissan Rogue - SHIPS FREE TODAY! Wiring Harness Ford Mustang 2001-2003. for select 1988-up. Antenna Adapter. Fuse Holders. - Factory Radio. Single/Double DIN Radio Bracket. - Signal Processors. - Dash Kits. 2014-Up Chevrolet Silverado. and includes everything you need to do the job correct including the dash kit. ISO DIN Radio Provision with Pocket. DIN Radio Provision with Pocket. 70-5520 Ford Wiring Harness. 70-5521 Ford Wiring Harness with Sub Plug. XSVI-5520-NAV Ford Digital Interface Wiring Harness. Holds a standard chassis single DIN (50mm x 180mm) or ISO mount radio. No cutting of the dash board required. Kit is custom designed for a perfect look and fit on these vehicles. Installation advice is not a substitute for proper installation. Contoured and painted silver to match factory dash. Custom design allows retention of the factory air vents in their original location. Antenna Adapter. Focus 2005- up. Focus C-Max 2005- up. DIN Head unit provisions with pocket. ISO DIN Head unit provision with pocket. DDIN Head unit provision. Painted Matte Black to Match Factory. The OEM integration dash kit is a scratch resistant matte black to match the factory style and finish. Radio trim panel. Bottom trim panel (pre-installed). Our Product Research Team. Installation Instructions. Holds Din or ISO Din units. Perfect for double din radios (4" tall). Perfect for 2 single din units (receiver equalizer, receiver dvd player, etc). Double DIN Radio Provision. LINCOLN Mark LT (2006). Radio Installation Kit for FORD MUSTANG SHELBY GT 2007 - 2008. Radio Installation Kit. Need help?. Talk to the experts by calling 1-877-701-HALF (4253). Car Audio Accessories. Marine Audio. Recessed DIN Opening. Installation Dash Kit for Double DIN Radios. Accommodates Double DIN mount. 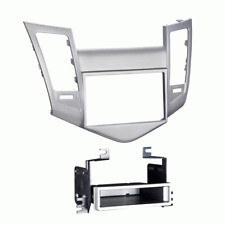 For 1999 - 2002 GM Full-size Trucks and SUV’ s. Gapless fit between the dash and the kit. Amplifier Install Kit. Kit Includes. Installation Dash Kit for Single or Double DIN Headunits. Includes a storage pocket below the radio for single DIN mounting. Accommodates ISO Single DIN mount. Accommodates ISO Double DIN mount. For Ford Focus vehicles. SingleDIN Radio Provision. DoubleDIN Radio Provision. Radio Housing Trim Plate. Painted to match factory dash color. Designed and manufactured with precision tolerances, resulting in a gapless fit between the dash and the kit. Radio Housing. Kit Includes.